If you’re interviewing for call center jobs, this article will help you get hired. 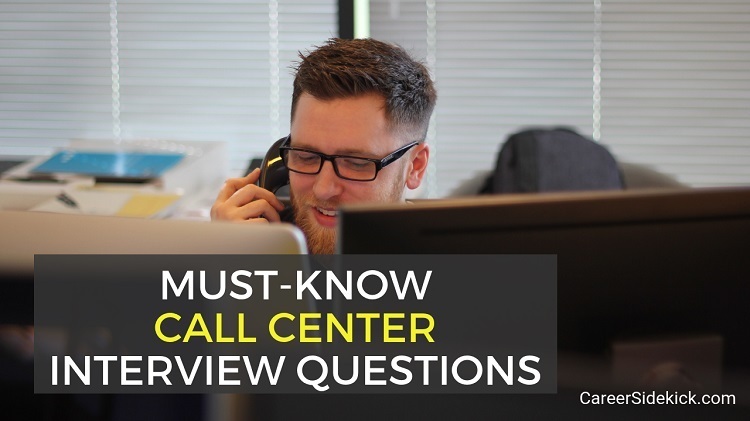 Along with the common interview questions all employers ask, there are some call center interview questions that you’re likely to hear specifically for that type of job. So we’ll look at 12 sample questions – broken down into 5 different types – and how to answer them. One type of question you’ll certainly hear for call center jobs is questions about your customer service skills. Now, depending on the job, you might not need any prior call center or customer service experience. Plenty of call centers interview entry level people. So don’t panic if they ask this and you don’t have any direct experience. Just be upfront, tell them you don’t have the exact thing they’ve asked about, and then try to explain why you’ll still succeed in this job and learn this job quickly. This is the next type of call center interview question you’re likely to hear. Since you’re interviewing for a call center job, which is usually a fast-paced job where they want speed, it’s best to tell them you enjoy that type of environment and do your best work in that environment. If you want to get the job offer, you can’t give them concerns that it’ll be too fast and hectic for you to handle. To recap, be ready to show you enjoy and thrive in fast-paced environment. And if you’ve worked in this environment before, prepare a couple examples of how you succeeded, challenges you overcome, why you enjoy it, etc. You might also hear questions in your call center interview about their particular industry. If they ask this, they want to make sure you’ll be able to succeed in learning their materials and being able to help customers quickly. They want to know that you can understand their audience, technologies and products. They want to hire people who can get up to speed quickly and start contributing results! Or if you have been working in another industry, explain how you learned that industry in the past. If you successfully learned a different industry, it can help you prove that you’ll be able to quickly learn theirs too. Being in a call center can be difficult and mentally draining. You’ll have days where you do everything right and a customer still gets angry and yells at you. So expect a few interview questions designed to make sure you can handle it mentally. For example, they might ask you about a time you failed. They might ask how you deal with failure or rejection. Be ready to show that you’re capable of handling the ups and downs and that you can bounce back mentally if something doesn’t go your way. Hiring managers for any call center job will want to make sure this is actually what you want to be doing. They don’t want to hire someone who’s going to quit or change their mind after being trained for a month or two. If they ask this, they’re looking to see that you’re applying for other jobs of this type, or other similar jobs (customer service, etc.). You don’t want to tell them you’re looking at 10 HR jobs and just one call center job. That’s going to be a big red flag and will make them worry that you don’t really want a call center job. So be ready for that, too. As a final step, make sure to go practice. All of these topics are very important to hiring managers, so don’t talk to an HR person or hiring manager without practicing these call center interview questions. You’re likely to hear most or all of these questions in a phone interview, or early in the face-to-face interview process, so be ready.